Sometimes, wires of home appliances get tangled, damaged by either by pests or people, accidentally cut, or damaged due to sheer age. If a wire does suffer damage, this is a headache as the appliance would either not work or you would have difficulty distinguishing a wire from others, which could cause a serious accident. To prevent these problems, enter heat shrink tubing, Engineering Supplies notes. Repair: It can repair cuts and splices on wires and connections. Because it can shrink in heat, it can be easily cut and molded. Sealant: It can be used as a sealant for moisture and contaminants. Insulator: Heat shrink tubing has a very good insulating capacity for wires. Organize: It can help bundle tangled connectors, wires and cables. Protect: It has the ability to protect wires from corrosion, liquid, chemicals and dust. Double check the size: Check the size of the tubing; the recovered diameter or the diameter after it has shrunk, and the expanded diameter or the diameter before it will shrink. The recovered diameter must be smaller than the one to insulate. Cut the necessary length: Heat shrinking tubing can be easily cut. When cutting, always give an allowance of ¼” which serves as an overlap to another tubing. Placing the heat shrink tubing: Make sure that the tubing can overlap the other tubing to fully cover the splice. Place the heating agent: Double check the temperature to use in heating the tubing. Apply the heat lengthwise by moving it by back and forth to apply heat evenly. 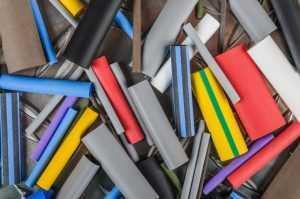 Heat shrink tubing is a versatile way to deal with tangled and exposed wires. Still, proper use must be observed to avoid further mishaps.